Tag Archive | "state champs"
This was the scene last fall after the Cedar Springs Red Hawks beat Northview and were champions for the second year in a row in the OK Bronze. They kick off their season tonight (Thursday, August 25) at Zeeland West. Photo by K. Alvesteffer and Rob Lalone. Thursday, August 25, marks the first game of the 2016 season for the Cedar Springs Red Hawks, and you don’t want to miss it! They face off against the Division 4 state champs, Zeeland West, at Zeeland at 4 p.m. It’s the Grand Rapids Press game of the week. Last year the Red Hawks clinched a share of the OK Bronze Championship, and shared it with Forest Hills Eastern. It was the second year in a row they were champions, as well as made it into the playoffs. This year, the OK Bronze was dissolved, and the teams moved to other conferences. The Red Hawks are now in the OK White, where they will face teams such as Greenville, Northview, Forest Hills Northern (all from OK Bronze), Forest Hills Central, Lowell, and Grand Rapids Christian. Next week they play long time rival Sparta, at Sparta. 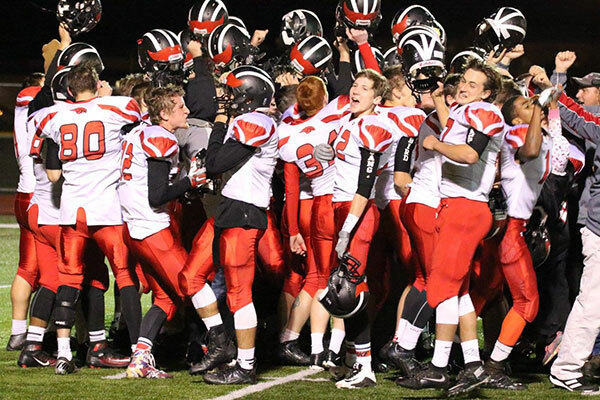 Come on out and cheer on your Cedar Springs Red Hawks!